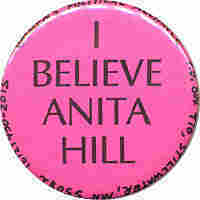 On This Day In 1991: House Members March To Senate In Thomas Protest : It's All Politics On this day in 1991, seven Democratic women from the House march over to the Senate to demand a delay in the confirmation vote for Clarence Thomas, who is accused by Prof. Anita Hill of sexual harassment. With it looking likely that the all-male Senate Judiciary Committee would proceed with a vote on the Supreme Court nomination of Clarence Thomas without considering the sexual harassment charge leveled against him by Anita Hill, seven female Democratic members of the House march over to the Senate in a dramatic display of protest to "demand justice." For the most part, senators from both parties seem to be dismissive of Hill's charges. But with feminist groups up in arms, the seven congresswomen -- Barbara Boxer (Calif.), Pat Schroeder (Colo.), Barbara Kennelly (Conn.), Louise Slaughter (N.Y.), Jolene Unsoeld (Wash.), Patsy Mink (Haw.) and Nita Lowey (N.Y.), as well as Delegate Eleanor Holmes Norton (D.C.) -- head over to the Senate to demand that the confirmation vote be delayed until the charges can be investigated. Later this day, the Senate agrees to the delay. But on Oct. 15, by a vote of 52-48, the Senate confirms Thomas as the court's 106th justice. He succeeds the retired Thurgood Marshall, becoming the court's second African-American member, following Marshall. Flashback Friday is a weekly feature on Political Junkie. Sign up for our weekly mailing list at politicaljunkie@npr.org.